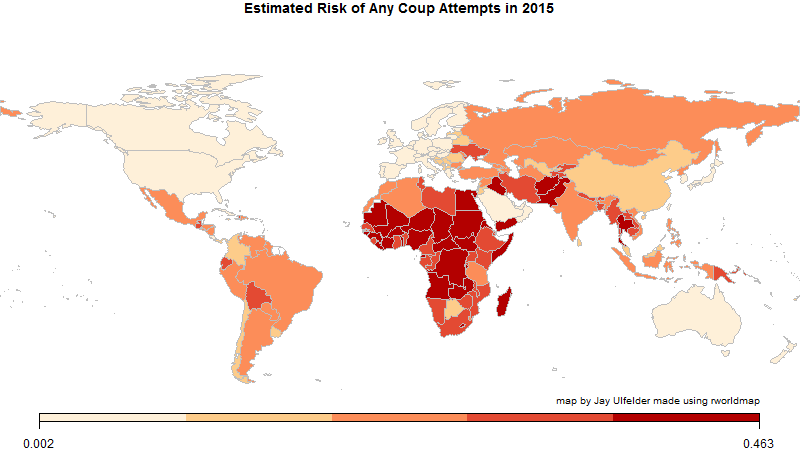 Which countries around the world are more likely to see coup attempts in 2015? For the fourth year in a row, I’ve used statistical models to generate one answer to that question, where a coup is defined more or less as a forceful seizure of national political authority by military or political insiders. (I say “more or less” because I’m blending data from two sources with slightly different definitions; see below for details.) A coup doesn’t need to succeed to count as an attempt, but it does need to involve public action; alleged plots and rumors of plots don’t qualify. Neither do insurgencies or foreign invasions, which by definition involve military or political outsiders. The heat map below shows variation in estimated coup risk for 2015, with countries colored by quintiles (fifths). 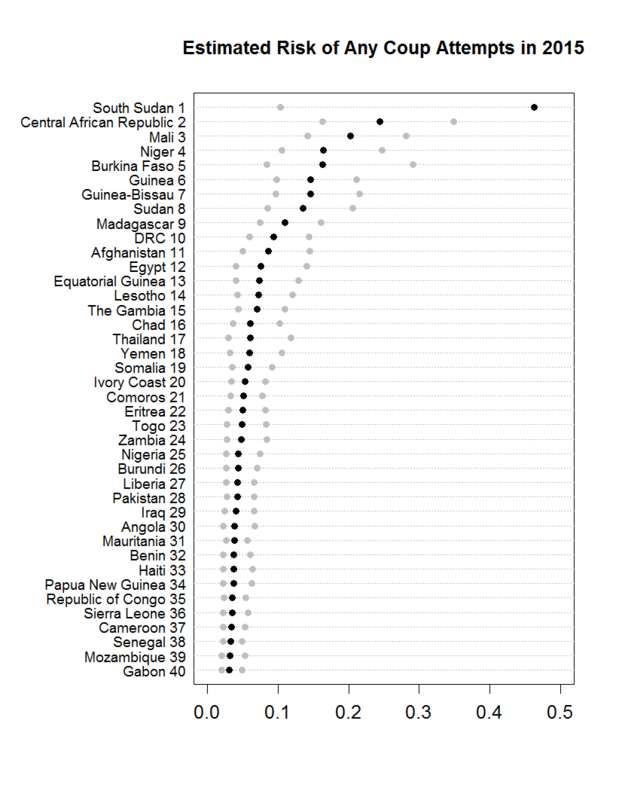 The dot plot below shows the estimates and their 90-percent confidence intervals (CIs) for the 40 countries with the highest estimated risk. The estimates are the unweighted average of forecasts from two logistic regression models; more on those in a sec. To get CIs for estimates from those two models, I took a cue from a forthcoming article by Lyon, Wintle, and Burgman (fourth publication listed here; the version I downloaded last year has apparently been taken down, and I can’t find another) and just averaged the CIs from the two models. Post–Cold War period. A binary variable marking years after the disintegration of the USSR in 1991. Regime type * regime duration. Interactions to condition the effect of regime duration on regime type. Regime type * leader’s tenure. Interactions to condition the effect of leader’s tenure on regime type. Regime type * election year. Interactions to condition the effect of election years on regime type. Regime type * economic growth. Interactions to condition the effect of economic growth on regime type. As I’ve done for the past couple of years, I used event lists from two sources—the Center for Systemic Peace (about halfway down the page here) and Jonathan Powell and Clayton Thyne (Dataset 3 here)—to generate the historical data on which those models were trained. Country-years are the unit of observation in this analysis, so a country-year is scored 1 if either CSP or P&T saw any coup attempts there during those 12 months and 0 otherwise. The plot below shows annual counts of successful and failed coup attempts in countries worldwide from 1946 through 2014 according to the two data sources. There is a fair amount of variance in the annual counts and the specific events that comprise them, but the basic trend over time is the same. 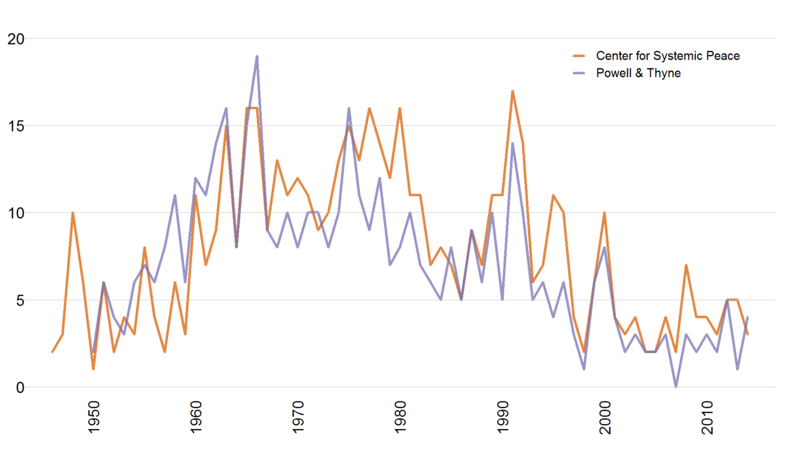 The incidence of coup attempts rose in the 1950s; spiked in the early 1960s; remained relatively high throughout the rest of the Cold War; declined in the 1990s, after the Cold War ended; and has remained relatively low throughout the 2000s and 2010s. I’ve been posting annual statistical assessments of coup risk on this blog since early 2012; see here, here, and here for the previous three iterations. I have rejiggered the modeling a bit each year, but the basic process (and the person designing and implementing it) has remained the same. So, how accurate have these forecasts been? The table below reports areas under the ROC curve (AUC) and Brier scores (the 0–1 version) for the forecasts from each of those years and their averages, using the the two coup event data sources alone and together as different versions of the observed ground truth. Focusing on the “either” columns, because that’s what I’m usually using when estimating the models, we can see the the average accuracy—AUC in the low 0.80s and Brier score of about 0.03—is comparable to what we see in many other country-year forecasts of rare political events using a variety of modeling techniques (see here). With the AUC, we can also see a downward trend over time. With so few events involved, though, three years is too few to confidently deduce a trend, and those averages are consistent with what I typically see in k-fold cross-validation. So, at this point, I suspect those swings are just normal variation. The separation plot designed by Greenhill, Ward, and Sacks (here) offers a nice way to visualize the accuracy of these forecasts. The ones below show the three annual slices using the “either” version of the outcome, and they reinforce the story told in the table: the forecasts have correctly identified most of the countries that saw coup attempts in the past three years as relatively high-risk cases, but the accuracy has declined over time. Let’s define a surprise as a case that fell outside the top 30 of the ordered forecasts but still saw a coup attempt. In 2012, just one of four countries that saw coup attempts was a surprise: Papua New Guinea, ranked 48. In 2013, that number increased to two of five (Eritrea at 51 and Egypt at 58), and in 2014 it rose to three of five (Burkina Faso at 42, Ukraine at 57, and the Gambia at 68). Again, though, the average accuracy across the three years is consistent with what I typically see in k-fold cross-validation of these kinds of models in the historical data, so I don’t think we should make too much of that apparent time trend just yet. This year, for the first time, I am also running an experiment in crowdsourcing coup risk assessments by way of a pairwise wiki survey (survey here, blog post explaining it here, and preliminary results discussed here). My long-term goal is to repeat this process numerous times on this topic and some others (for example, onsets of state-led mass killing episodes) to see how the accuracy of the two approaches compares and how their output might be combined. Statistical forecasts are usually much more accurate than human judgment, but that advantage may be reduced or eliminated when we aggregate judgments from large and diverse crowds, or when we don’t have data on important features to use in those statistical models. Models that use annual data also suffer in comparison to crowdsourcing processes that can update continuously, as that wiki survey does (albeit with a lot of inertia). We can’t incorporate the output from that wiki survey into the statistical ensemble, because the survey doesn’t generate predicted probabilities; it only assesses relative risk. We can, however, compare the rank orderings the two methods produce. The plot below juxtaposes the rankings produced by the statistical models (left) with the ones from the wiki survey (right). About 500 votes have been cast since I wrote up the preliminary results, but I’m going to keep things simple for now and use the preliminary survey results I already wrote up. The colored arrows identify cases ranked at least 10 spots higher (red) or lower (blue) by the crowd than the statistical models. As the plot shows, there are many differences between the two, even toward the top of the rankings where the differences in statistical estimates are bigger and therefore more meaningful. For example, the crowd sees Nigeria, Libya, and Venezuela as top 10 risks while the statistical models do not; of those three, only Nigeria ranks in the top 30 on the statistical forecasts. Meanwhile, the crowd pushes Niger and Guinea-Bissau out of the top 10 down to the 20s, and it sees Madagascar, Afghanistan, Egypt, and Ivory Coast as much lower risks than the models do. Come 2016, it will be interesting to see which version was more accurate. If you are interested in getting hold of the data or R scripts used to produce these forecasts and figures, please send me an email at ulfelder at gmail dot com. I am curious about South Sudan since it seems to be more a civil war between two sides than a situation where one set of elites or a unified military might push out the old leaders. It’s the same sense that Syria isn’t at very great risk of a coup. With Egypt, my thinking at least was that it was precisely because Egypt had just had this coup that another was fairly unlikely in the near future. With the military decisively behind a system that they had to defend because of the crimes committed in repressing the Muslim Brotherhood, I couldn’t see how anyone inside the country could realistically use force to change the leadership. Please read – very interesting: content-wise and methodologically!